1: Place rack on upper third of oven. Preheat oven to 425°F. Coat the bottom of a shallow roasting pan or baking sheet with a thin layer of olive oil. 2: Mix together the mayonnaise, mustard, and Worcestershire sauce in a medium bowl. Mix together the breadcrumbs and minced chives in a separate medium bowl. 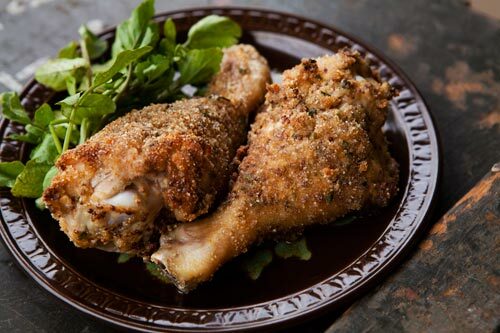 3 :Sprinkle each drumstick with salt. One by one, dip each drumstick in the mayonnaise mixture, turning to coat. Then dip the drumstick in the breadcrumbs mixture, turning to coat. 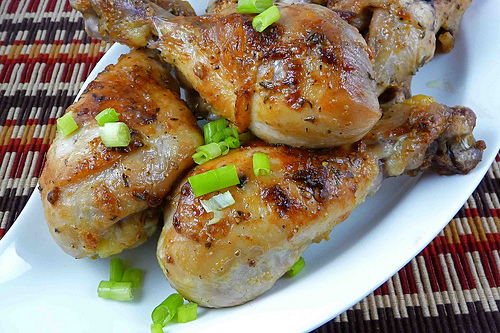 Place the drumsticks on the prepared roasting pan. 4: Bake chicken for 20-25 minutes, until just cooked through, and juices run clear (not pink) when poked with a sharp knife.